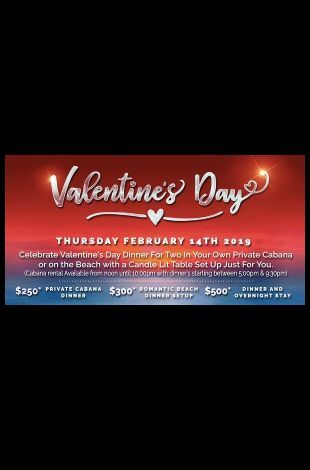 Please note Valentines Day - Dinner on the Sand - or - Private Cabana occurred in past. Looking for something special this Valentines Day? 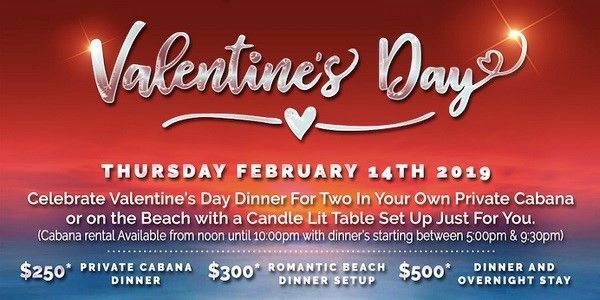 How about a romantic dinner for two served on the sand, or in the comfort of a private cabana?! Let our event coordinators arrange all of the details or work with them for special requests or details of your choosing. Then, head to Bamboo Beach Tiki Bar for some live music and breezy cocktails, or to Casa Calabria piano bar for classic upbeat and romantic live music, or to the comfort of your own cityview or oceanview hotel room.